Potential: Excellent – at Brady for discovery of a new Ni-Cu-PGE sulphide body. Very Good – for discovery of additional new sulphide zones along the Offset Dyke. Results: Generated drill-ready targets from borehole geophysical responses. Ownership: Wallbridge and partner Impala Platinum of South Africa to earn 50% by incurring expenditures of $5,000,000. Champion Bear maintains a carried interest until production. 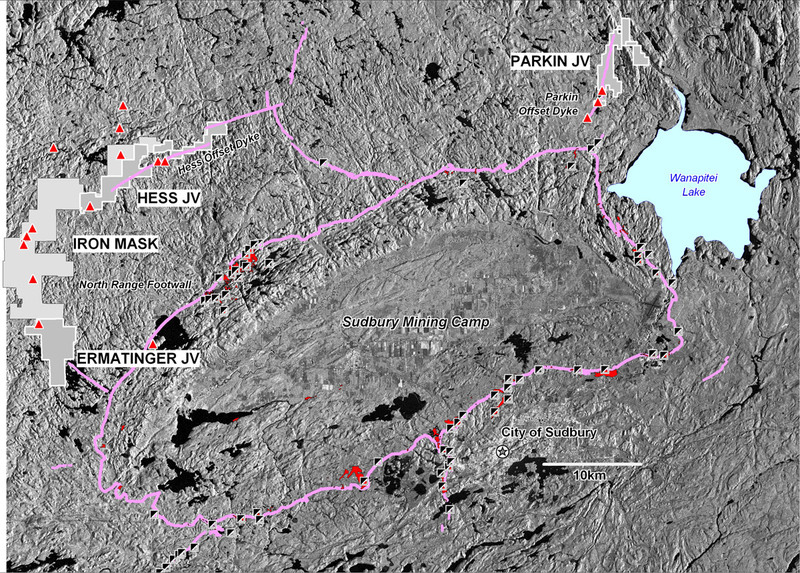 The Parkin Joint Venture Property is located in the footwall of the Sudbury Complex and overlies 7 km of the Parkin Offset Dyke. In the Sudbury Mining Camp, approximately 50% of all metal production is derived from the zones in the footwall of the Complex. 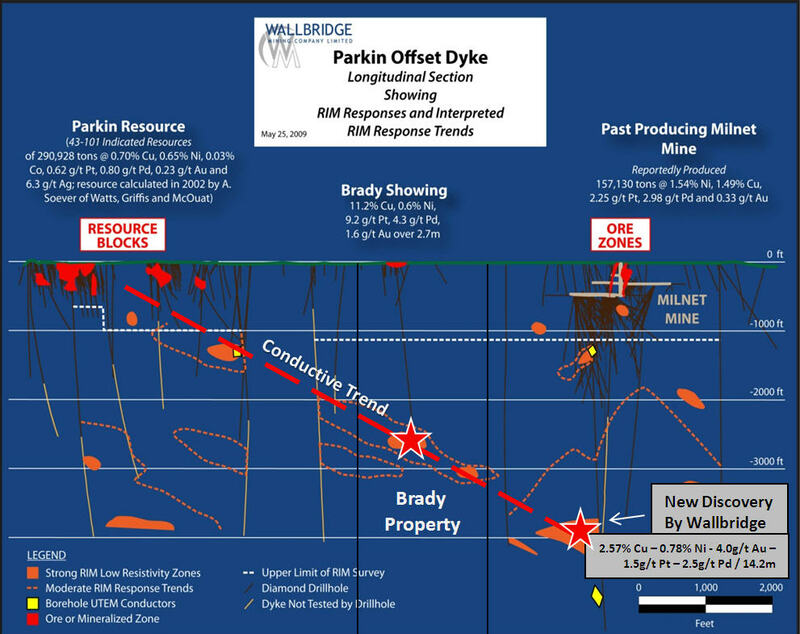 At Parkin, Wallbridge is the operator of the JV and is the first explorer to assemble the complete land package covering the Offset Dyke. The Parkin Offset Dyke hosts several known shallow, high-grade sulphide zones including the past-producing Milnet Mine (produced 157,000t @ 3.03% Ni+Cu and 5.46 g/t PGE), the Parkin Indicated Resource (291,000t @ 1.35% Ni+Cu and 1.65 g/t PGE) and the Brady Showing drilling (11.8% Ni+Cu and 15.1 g/t PGE). 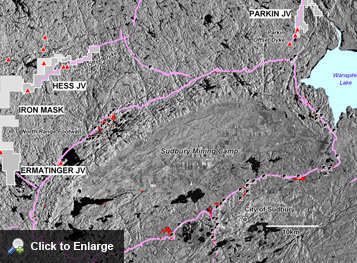 In addition, the Dyke joins the main mass Sudbury Igneous Complex at FNX Mining’s Podolsky Ni-Cu-PGE Mine and Vale-Inco’s past-producing Whistle open pit Mine. 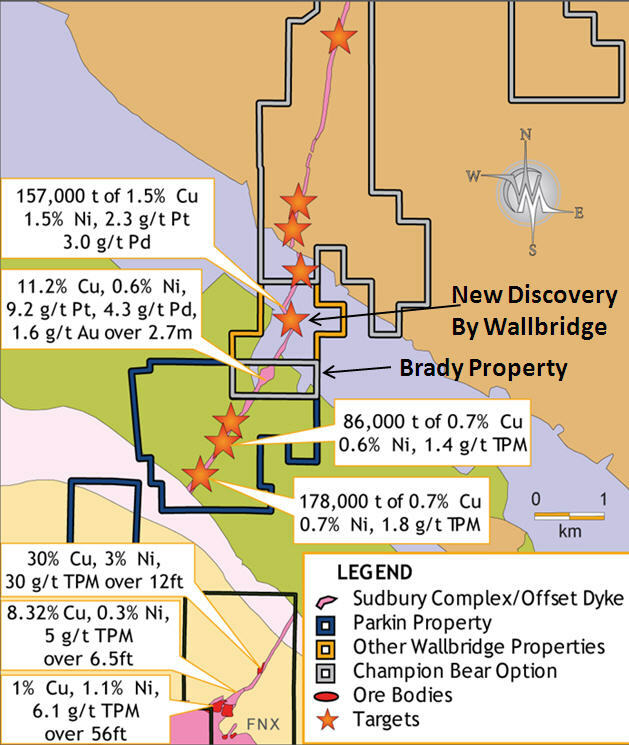 In February 2010, Wallbridge announced the second intersection into the new semi-massive sulphide discovery located 500m north of the Brady property – the intersections are: 0.78% Ni, 2.57% Cu, 1.50g/t Pt, 2.52g/t Pd, and 3.99g/t Au over 14.24m, and 0.44% Ni, 0.96% Cu, 0.88g/t Pt, 1.23g/t Pd, and 0.35g/t Au over 12.66m. Modeled borehole geophysical responses indicate a north plunging conductive trend down the strike of the Offset Dyke. The Brady anomaly lies on this conductive trend, up-plunge from Wallbridge's new discovery. 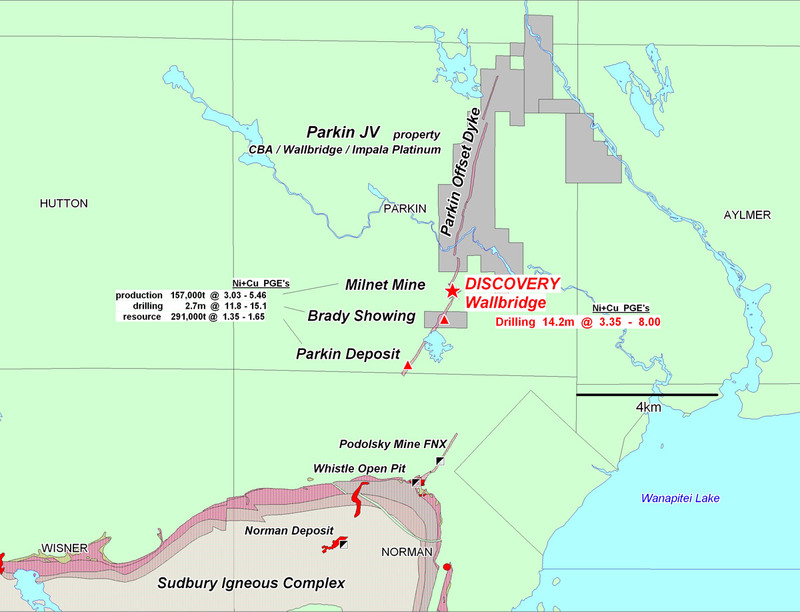 On the Brady property, 2009 drilling intersected over 850m of locally mineralized favourable Parkin Offset Dyke; follow-up borehole geophysical surveys further enhanced the quality and location of the targeted anomaly. Nearby on strike, Wallbridge Mining’s new high-grade discovery was intersected in 2 drill holes and drilling is ongoing. JV Operator has placed on care and maintenance.